Author(s): Baiyu Huang, Jacob Schliesser, Rebecca E. Olsen, Stacey J. Smith, Brian F. Woodfield. Department of Chemistry and Biochemistry, Brigham Young University, Provo, UT 84602, USA. Porous metal oxide nanoparticles is a new class of material of great scientific and technological importance with a wide range of applications. In this article, we briefly review the synthetic methods and thermodynamic properties of such materials. We compare and summarize common synthetic routes of such materials including solid-state, solutionphase (co-precipitation, sol-gel, microemulsion, solvothermal/hydrothermal, non-aqueous), and vapor-phase methods. As for the thermodynamics of porous metal oxide nanoparticles, we review experimental determinations, mainly by calorimetry, on surface and interfaces energetics. The interplay among particle size, surface area, morphology, surface stabilizer, phase stability, and redox potentials is discussed. Keywords: Metal oxides, nanoparticles, pore structure, surface energy, synthesis, thermodynamics. Affiliation:Department of Chemistry and Biochemistry, Brigham Young University, Provo, UT 84602, USA. Keywords:Metal oxides, nanoparticles, pore structure, surface energy, synthesis, thermodynamics. 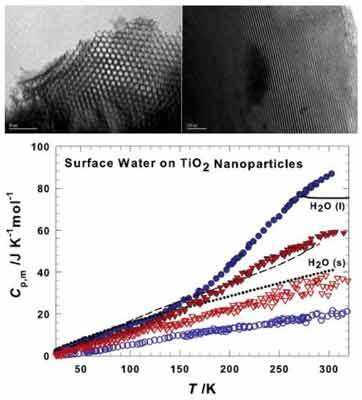 Abstract:Porous metal oxide nanoparticles is a new class of material of great scientific and technological importance with a wide range of applications. In this article, we briefly review the synthetic methods and thermodynamic properties of such materials. We compare and summarize common synthetic routes of such materials including solid-state, solutionphase (co-precipitation, sol-gel, microemulsion, solvothermal/hydrothermal, non-aqueous), and vapor-phase methods. As for the thermodynamics of porous metal oxide nanoparticles, we review experimental determinations, mainly by calorimetry, on surface and interfaces energetics. The interplay among particle size, surface area, morphology, surface stabilizer, phase stability, and redox potentials is discussed.